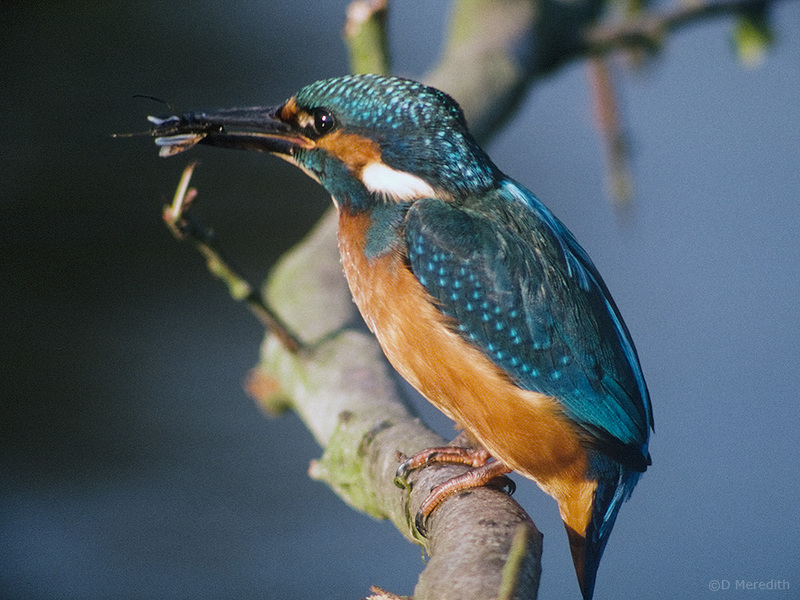 Common Kingfisher with an unusual snack. I didn't know whether to post this in the birds or insects community threads but as I've never identified the insect I shouldn't post it there. It is great to see those lovely sunny images from Peter and David as the weather has been rather gloomy here for much of the time recently. 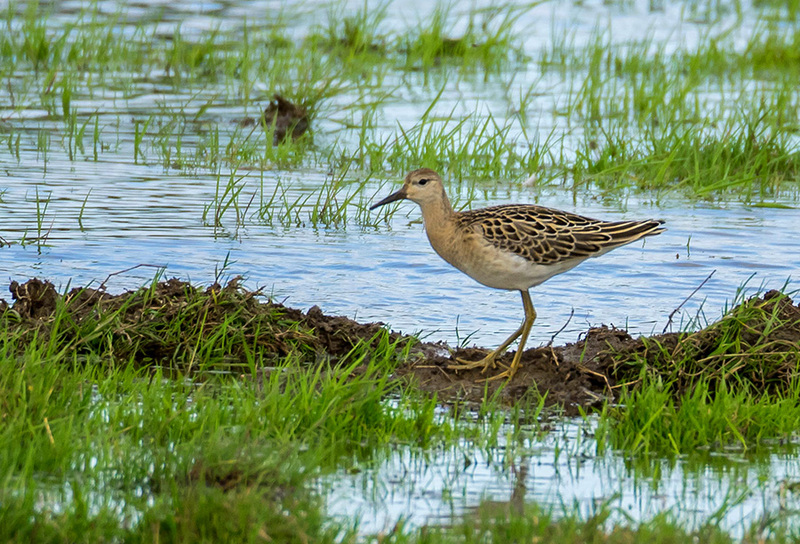 Looking through the files on my hard drive I came across these shots of a couple of Ruff on Carlton Marshes which I took last year. The reserve is a real bonus for the area, especially since they created a scrape there about three years ago. 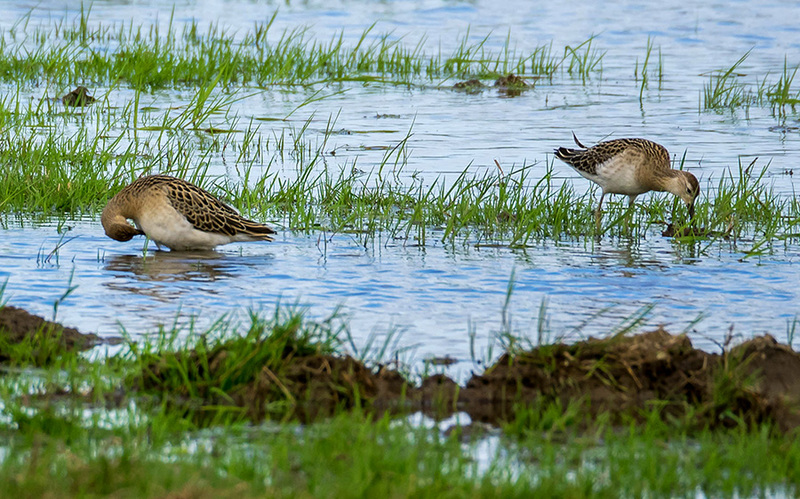 It is a treat to be able to watch waders feeding just a few miles from my home. There was great excitement last week as a couple of Spoonbills were spotted there, which must make all the hard work worthwhile. Red Kite swoops - from earlier this year. 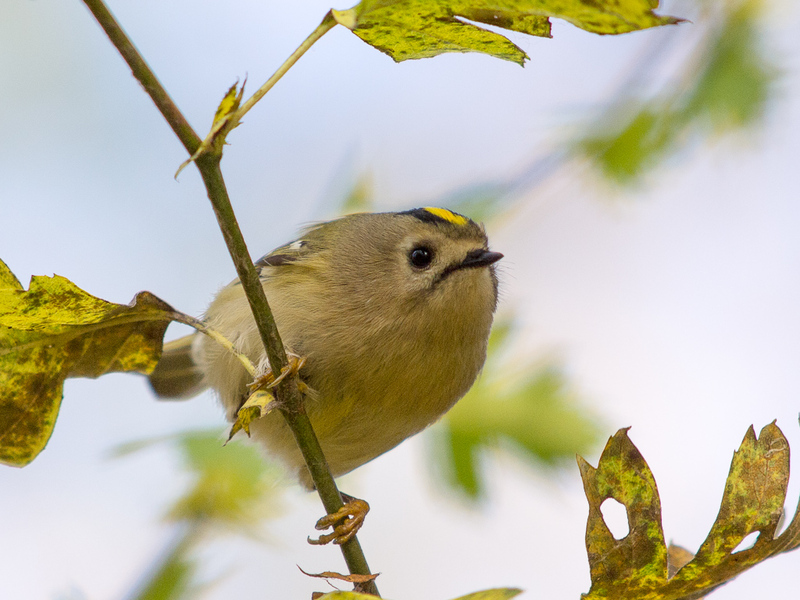 We often see many Goldcrests around in autumn, the peak usually occurs during the last week of October. They are all gone now. Tord, you've reminded me that I never had any Ruby-crowned Kinglets this autumn. They're the North American equivalent of Goldcrests. Some years we get lots, this year non. 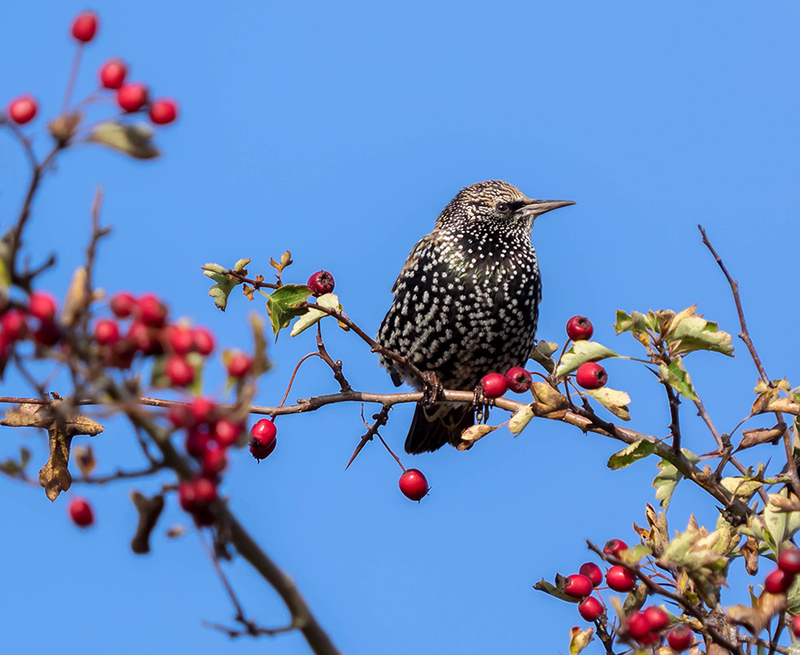 The autumn sunshine showed off the striking plumage of this Starling nicely as it perched amongst the berries at Minsmere. I have not had the good fortune to take a starling like the one above. Those berries might well be gone come the weekend Ron - the weather forecast looks rather blue. 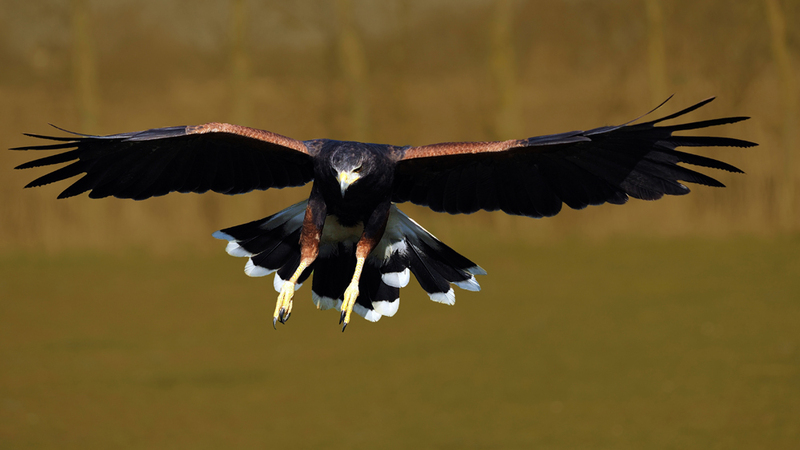 Just re processing some pix and thought this one suitable to post - harris hawk - female called Holly.. Yes Barry, I think the remaining berries will be in big demand as soon as the cold weather arrives. We will probably have a few more birds in the garden too. That is a very dramatic shot of the hawk. I like the viewpoint. We have a huge berry crop around here and I am beginning to see the fieldfares and redwings getting busy. It has been very mixed weather and I have been trying out a new lens and camera when the sun was not sulking, so I cannot post anything here. But I have sorted my long lens solution out. I did find a few pictures from earlier in the year which cheered me up so I will play with them and add them later. Glad to see this thread is still going Ron. On a walk earlier in the year I heard, and then saw this nest. They were putting up quite a noise and were clearly getting grumpy. On this photo a couple of chicks were laying down in the nest (I imagine they needed to do that in rotation - as it was a fairly full home). That is quite a nestful Peter. I imagine they were pleased to leave. I have been looking at your shots of Fieldfares and Red Kites and you seem to be getting on well with the new gear. I see you have gone for the zoom rather than the more common prime but I think the ability to adjust the focal length for wildlife is well worth having. Thanks Ron, Part of the fun is the story for me and going back to see them develop. But I didn't manage to get back before they left the nest. On the new kit, I have just upgraded the lens, the pictures you saw were from the old version I swapped to the more recent version which is just stunning. The zoom allows me to just have one lens permanently attached. It gives me close focus to a couple of feet and pretty much instant focus. A one lens system just for birds. But it does mean I have a few less to share here. I noticed that the Reed Buntings were taken with the new version but I didn't realise that the Kites and Fieldfares were with the mark 1. It's looking good. How is the continuous autofocus? Well the Reed Buntings were taken at a distance that I previously used to just watch birds at. So I am coming to terms with taking pictures at greater distance and sometimes being quite shocked by the result. It is on CF most of the time. So as I was taking the picture of the bullfinch at about 30 yards my friend said Marsh Harrier. I looked up took 5 reaction shots and got 5 pretty fair record shots once I worked on them. My previous episodes with marsh harriers were not as positive. Yesterday, was the first day I had it and it was abysmal weather. Wet, windy and dark. So pictures will get better. Your mention of the fieldfares jolted my memory that I also had my Olympus kit with me. The fieldfares had just arrived in a flock of between 50-100 birds, half starlings half fieldfares. They were busy stripping a fairly large Rowan tree. I sat in my car hide and was able to shoot at the birds from about 30 yards at the top of a nearby look-out tree so these are cropped. I then swapped and so the other system version is on Flickr should you wish to see it.